The Stiltz Home Lift is rapidly becoming a familiar name in architectural circles. Professional architects researching domestic lift solutions for clients who are keen to ‘future proof’ their home will discover the unique Stiltz lift has many standout features which make it functional, beautiful and stylish. Its innovative features mean the product can be installed virtually anywhere in the home including in the void of a stairwell, a cupboard to cupboard application or a ‘thru car’ option which allows users to enter and exit the lift from both sides of the lift. The Stiltz Home Lift preserves precious floor space as it has one of the smallest residential lift footprints available and its semi-transparent body enables it to effortlessly blend into the decor of any room. Operationally, Stiltz domestic lifts are virtually silent, a smooth ride and travel between floors in less than 30 seconds. Two discreet yet robust vertical stilts carry the entire load of the home lift, so no major structural alterations to the home are needed. 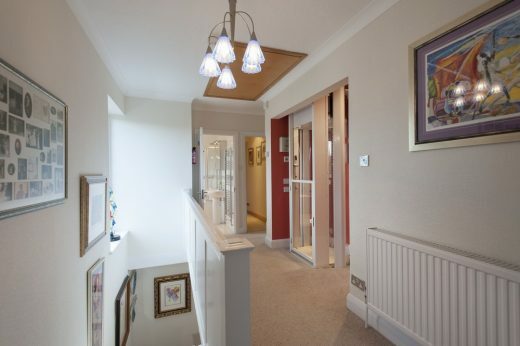 The Stiltz Home Lift is also extremely flexible due to its modular sections which can easily pass beneath a standard doorway during installation. The only structural work required is an opening in the ceiling to allow the lift to pass between floors. Once installed, the Stiltz lift plugs straight into a standard 13-amp power socket thanks to its self-contained drive system making it extremely cost-effective to run. It also includes an emergency battery back-up, which allows the lift to return to the lower floor position in the event of a power cut.